A lot of information about the Google Phone, which is fast becoming the talk of the town has been released recently. 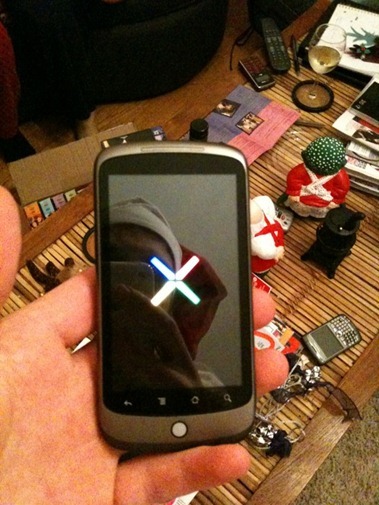 And now a San Francisco based blogger by the name of Cory O’Brien has managed to grab a snapshot of Nexus One. He has nicely described the device as; “Google Phone = iPhone + a little extra screen and a scroll wheel. Great touch screen, and Android.”. 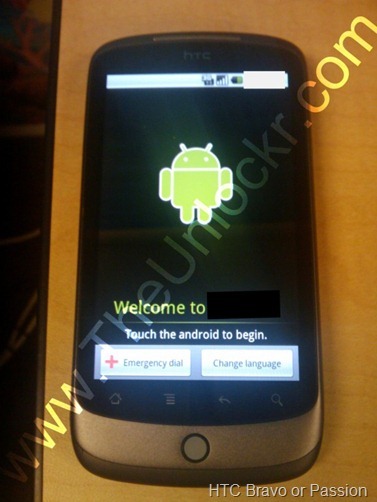 As can be seen in the picture posted above, the device looks alot like the HTC Passion/Bravo which is also slated for early 2010 release, with a slightly bigger screen than the iPhone and one scroll button like on HTC Hero. The device does not show HTC brand on it. You may compare the two pictures; Nexus One posted above, and HTC Passion/Bravo posted below. You can follow us on twitter or join our facebook fanpage to keep yourself updated on all the latest from Android phones. This phone looks to be very exciting and interesting! It is going to be very interesting to see how Google flips the whole wireless industry on its side.